Proper surface preparation before hanging the mural is very important and essential for good results. This stage must therefore be carried out with the utmost care. 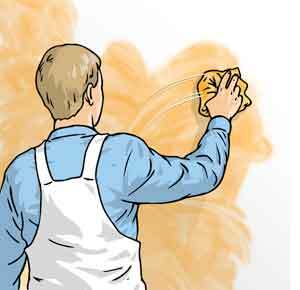 - The prepared surface must be low-absorbent, clean, dry, smooth and free of dust and remnants of any pigments which could stain the mural. - Remove old wallpaper. Old paint layers that partially or wholly cover the wall and which could make it difficult for the paste to penetrate the wall must be removed. - All damage, scratches and unevenness must be filled and then smoothed with sandpaper. Then the wall must be cleaned with water and degreaser. - Dry mouldings, plasterboard and walls that are too porous or absorbent must be treated with a primer. 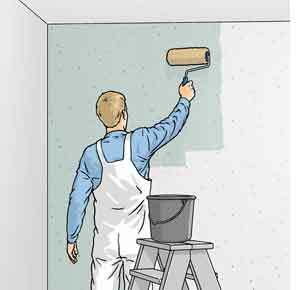 Prior to application of the primer, check whether the product you are using has been absorbed properly and has not merely formed a layer on the wall. - If you are not sure whether the wall requires primer, apply it anyway as a preventive measure. 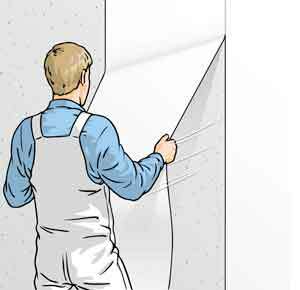 - Plastered walls: before pasting the mural, check if the surface is dry. - The bases of any newly-plastered walls can be neutralised with a primer. - On walls that have been previously painted with emulsion paint, a thin layer of wallpaper paste should be applied with a brush or a roll to the area where the mural will be hung. Wait until the wall is completely dry. This treatment prevents the adhesive from being absorbed too quickly into the wall, and therefore helps when positioning the mural and removing air bubbles and ripples. - Do not hang murals on wet surfaces. Wait until the walls are completely dry. If you do hang on wet walls, there is a risk that the mural will not adhere properly and that mould might develop. Before pasting, check the condition of the wall mural. In order to check the condition of the mural and make sure it meets expectations, place the panels next to each other on a clean dry floor with the printed face upwards. If the mural is composed of a number of panels, make sure the pattern is correct, and that the colour and thickness of the different components do not vary at the joints. Paste the wall. Use "Perfax Roll-on" or "Perfax Roll-on magic"
1. Begin hanging by defining the position of the mural panels on the wall. We recommend that you start at a window and work towards the door. Before hanging the first mural panel, mark the position of the edge by drawing a line with a pencil. It is important that these lines be drawn accurately. This avoids any problems with previously pasted strips shifting position. 2. Hang vertically, in such a way that the first panel is pasted about 15 mm around the corner where the mural begins. Cut panels to wall height + 5 cm oversize to compensate for any variation in floor and ceiling height. If the panels require numbering, use only a black graphite pencil. 3. 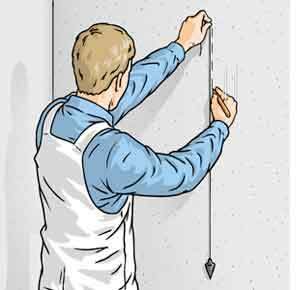 Apply an even layer of paste to the wall with a roller or brush. 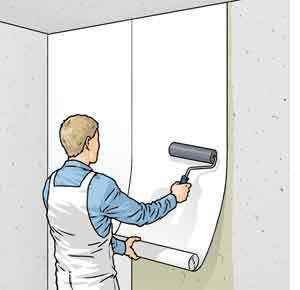 Apply the paste systematically so that it does not dry before the wall mural is applied. It is best to apply the paste to a surface slightly larger than the panel. 4. 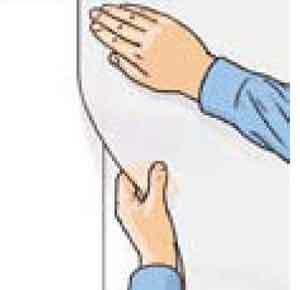 After hanging the panel, press it against the wall with the roller using vertical movements. 5. Apply the next panel with overlap. All edges are professionally cut and should overlap by 15 mm. This means that each section of the mural is applied 15 mm on top of the previously applied section. Please note: if the panels are placed exactly next to each other, the pattern will not line up. 6. The panels are applied with overlapping, cut the material in the middle of the overlap with a thin-bladed Stanley knife. 7. Use a steel ruler or a spatula as a guide when cutting this seam. If it is necessary to shift the steel ruler or a spatula downwards, do not remove the knife from the cut. PLEASE NOTE: Do not cut into the surface below, because it may cause the seams to open afterwards. 8. The top strip falls off by itself, the underlying strip must be removed. Before closing the seam, retouch the surface at the seam with a paste brush. 9. Remove excess paste with a clean damp sponge. Do this after application of each panel of the mural, before the paste can dry. Never scrub more than once in the same place and never use chemical cleaners. The drying paste can damage the surface of the wall mural. 10. 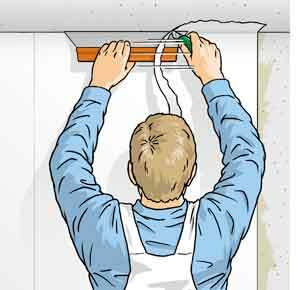 Trim any excess at the ceiling and skirting board with a spatula and a Stanley knife. Keep the knife in the cut when moving the spatula. PLEASE NOTE: Remember that each print has limited resistance to mechanical wear. Nikkel - Art guarantees that the quality of the product is suitable for its purpose, but has no control over the circumstances and manner in which it is used. Nikkel - Art is not liable for the work of the designer and installer. PLEASE NOTE: Depending on the nature of the print, apply the next panel with overlap. All edges are professionally cut and should overlap by 15 mm. This means that each piece of the mural is applied 15 mm on top of the previously applied piece. Please note: if the panels are placed exactly next to each other, the pattern will not line up. 1. The surface must be dry, clean, firm, absorbent and smooth. Mark the width of the panel on the wall with level lines. 2. Apply wallpaper paste, soaking time is not necessary. 3. Apply the next panel with overlap. All edges are professionally cut and should overlap by 15 mm. This means that each section of the mural is applied 15 mm on top of the previously applied section. Please note: if the panels are placed exactly next to each other, the pattern will not line up. 4. Press the wall mural panel with a foam rubber roller. 5. 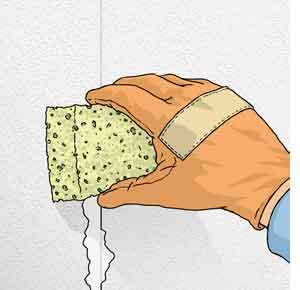 Remove excess paste with a clean damp sponge. Do this after application of each panel of the mural, before the paste can dry. Never scrub more than once in the same place and never use chemical cleaners. The drying paste can damage the surface of the wall mural. 6. Finish corners with a wallpapering trowel and a Stanley knife or with scissors. 7. 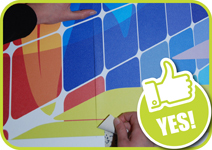 After pasting the design, the entire surface of the panels must be cleaned with a damp cloth. 8. 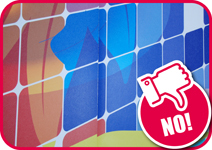 If necessary, the panels can be pulled off dry at a later stage without leaving traces.